Since Blood Simple in 1984, Joel and Ethan Coen have never much concerned themselves with anybody’s demands for “representation.” Yet Buster Scruggs takes this old tendency of theirs to a new high. An anthology of six premises for cowboy movies that the Coens have come up with over the years, Buster Scruggs features a cast—the biggest names in it are Liam Neeson, Brendan Gleeson, James Franco, Tom Waits, Tim Blake Nelson, and Tyne Daly (in, curiously, a role that would normally be played by McDormand)—whom the Hispanophilic John Wayne would have found problematically lacking in diversity. Heck, Bonanza featured more nonwhites than does Buster Scruggs (which will debut this Friday on Netflix). Of course, being “represented” in a movie by the mordant Coens isn’t self-esteem-building. The white characters in Buster Scruggs tend to be homicidal, grasping, or, at best, long-winded. The only nonwhites in the entire movie are American Indians. They savagely attack twice, comically in the jokey second segment starring Franco as a lowbrow bank robber, thrillingly in the grand next-to-last episode, “The Girl Who Got Rattled,” in which a heroic wagon-train guide makes a one-man stand against a Sioux raid. “Now, listen to every word,” he said, rapidly. “Those Injins is goin’ to rush us in a minute…. “And if they kill me first”—he reached forward and seized her wrist impressively—“If they kill me first, you must take that pistol and shoot yourself. Understand? Shoot yourself—in the head—here!” He tapped his forehead with a stubby forefinger…. Native Americans are increasingly out of fashion, however, perhaps due to fears that they are, underneath it all, Red State voters. So the cultural establishment is likely not to give the Coens too much grief over their unironic portrayal of old stereotypes of Plains Indians that were held by those who actually knew them. Movies work best set in a Hobbesian world full of interest where you can’t just call 911; hence, Westerns were extremely popular from 1903 to the early 1970s. The long reign of Westerns preached a national self-conception that is now memory-holed. Instead of America being a Nation of Immigrants, as we’ve been indoctrinated in recent decades, America was then visualized as a Nation of Frontiersmen and Settlers. When discussing space exploration, people often invoke…the march westward in the 1800s…. But…these narratives are born from racist, sexist ideologies that historically led to the subjugation and erasure of women and indigenous cultures, creating barriers that are still pervasive today. But not the Coen brothers, who seem intent on continuing to do as they please. Despite Westerns being out of fashion for 45 years, the Coens’ biggest box office hit, their True Grit remake, was a traditional Western; their most honored film, their adaptation of Cormac McCarthy’s No Country for Old Men, was a neo-Western; and their most popular movie, The Big Lebowski, was introduced by cowboy actor Sam Elliott because, well…I don’t exactly know, other than that the Coens love Westerns, so why not have a wise old cowboy in a bowling movie? The second-best episode in Buster Scruggs is the fourth, an adaptation of Jack London’s 1905 short story “All Gold Canyon,” in which an old prospector (Waits), talking to himself in authentic frontier gibberish, uses his intuitive awareness of the bell curve to search for a pocket of gold in a paradisiacal Alpine valley. London (1876–1916) was a prodigious writer of adventure fiction who also influenced the Coens’ fellow old, weird America-loving Jewish Minnesotan Bob Dylan. That the two most appealing episodes in Buster Scruggs are adaptations while the four originals are more ingenious than enjoyable will remind old-timers of persistent criticisms of the Coen brothers going back to their 1980s quasi-Westerns Blood Simple and Raising Arizona. Like English playwright Tom Stoppard, the Coens are often accused of having more brain than heart. Personally, my view is that profound human emotions are all very fine, but basically everybody’s got them, so give me some cleverness. Nonetheless, I can understand the recurrent critiques of these cunning writers. And indeed Coen movies are generally less than delightful on first viewing. For example, virtually nobody found Lebowski funny during its theatrical run. On the other hand, the extraordinary lucidity of their movies makes many of them easy and enjoyable to remember later. 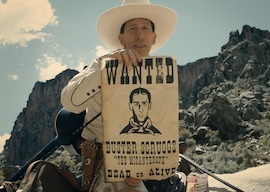 One of Buster Scruggs’ themes is that life in the Wild West tended to be lacking in entertainment, so people killed time by developing rhetorical skills beyond those seen today. Thus, numerous characters launch into elaborate Dickensian monologues. For example, a loquacious fur trapper only gets to talk when he comes to town every few years, but boy, does he have a lot to say when he arrives. Yet I’m not sure that the Coens’ usual genius for matching actor to dialogue—e.g., John Goodman as a John Milius-like Walter Sobchak in The Big Lebowski—is working fully here. While much of the dialogue is exquisite, too many of characters to be distinctive sound like George Clooney’s verbose con man in O Brother Where Art Thou? The Coens’ last movie, 2016’s Hail, Caesar!, about a 1951 cowboy actor and a Catholic movie-studio fixer patriotically battling a Soviet spy cell of Marxist screenwriters, was similarly made up of disparate ideas. The Coens put a fair amount of effort then into trying to knit those episodes into a cohesive tale; but perhaps the superstructure of that movie just ended up distracting viewers from the superb bits that you can watch on YouTube. This time, the Coens didn’t bother making up a story to wrap around their six plots. Nor are they tied together symbolically beyond that they’re all set in the 1870s Wild West and numerous characters get shot right between the eyes, which gets old after a while. This kind of short-story collection in film form in seldom done, probably with good reason. Anthology films are most common in the horror genre, where audiences seem to be most tolerant. Not surprisingly, the four original segments of Buster Scruggs have horror elements. In the comically bizarre title section, for instance, a smiling singing cowboy in a white hat, Buster “The Misanthrope” Scruggs, a genial but psychopathic Will Rogers who never met a man he didn’t kill, guns down anyone in his path as remorselessly as Anton Chigurh in No Country. There have been a few famous non-horror movies that are collections of shorts, such as Disney’s Fantasia. But mostly the moviegoing public preceded the fiction-reading public in turning against short stories. In recent years, the trend has been to drag out stories over longer and longer lengths. So it’s not likely that Buster Scruggs will be a huge hit over the next month. But the Coens’ track record suggests you shouldn’t count them out.